Get together with people of all ages to produce, publish and embody slogans under the guidance of members of the Partisan Social Club. Channel your political energies in a practical workshop as part of the nationwide Big Draw festival. Free tickets available to book here. Meet new people and learn how to embrace your ideals – a practical workshop about publishing and embodying slogans as part of the nationwide Big Draw festival. For everybody and young people on holiday at half-term especially welcome. ‘On being together; memberships, collectives and unions’ will develop new artworks dedicated to the concept of ‘membership’ to be sited in the outdoor spaces of Beaconsfield Gallery Vauxhall (BGV), London. 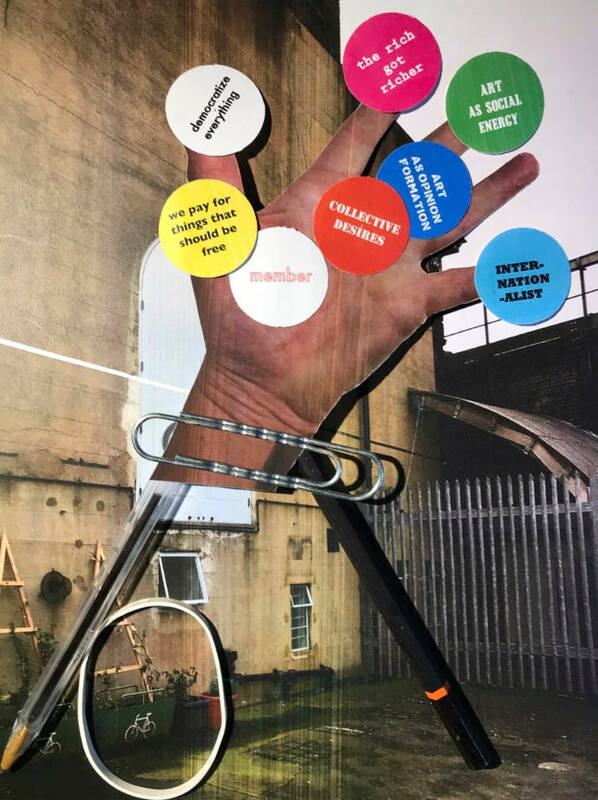 The project invites ‘members’ to join in with the realisation of a social sculpture: its design, build and the programming of its activities around collectives, unions, groups and clubs. Leading the project are the Partisan Social Club and architect Sean Griffiths. The end goal is to enable a new assemble to emerge who will work together to publish ideas and thinking (texts and slogans) on collectivizing, here and now. We are keen to develop new collaborative and informal techniques of working on architectural structures – enabling improvised responses from a team of members working in a ‘real’ and ‘now’ situation. ‘Spatial working – responding to function and space’, including the production and installation of the final designs. The opening Launch is on 5 October 2018 – if you want to see the results! To become a ‘member’ of the new collective it will be important to attend the first workshop on 13thSeptember at Beaconsfield Gallery Vauxhall, 10.30 – 5pm.